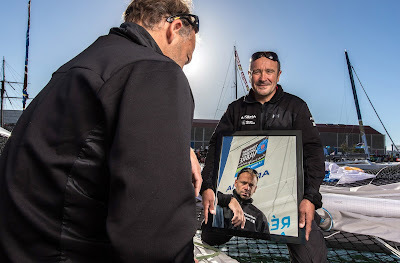 At 2158hrs UTC ( 2258hrs French time) this Sunday evening race direction of the Transat Jacques Vabre double handed race from Le Havre to Itajai, Brazil received a call from Yann Elies the co-skipper of nearby FenêtréA Cardinal (0.5 miles away) to inform them that the Multi 50 trimaran Arkema - Aquitaine had capsized. At 2204hrs UTC (2304hrs French) Arkema – Aquitaine’s co-skipper Mayeul Riffet also contacted the race director by Iridium phone to inform them that all was well aboard the capsized trimaran. 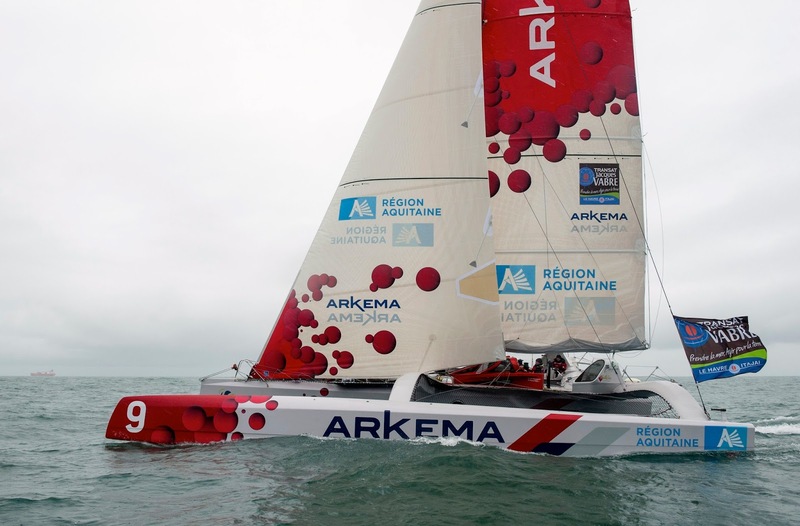 The two French skippers, Lalou Roucayrol and Mayeul Riffet, are safe. The boat is 210 miles to the west of Cascais, Portugal. Equipped with survival suits, the pair of sailors are dry inside the trimaran and are working on how organize their rescue. Just now the sailors do not plan to leave the boat. They have activated their Argos beacon so their position and trajectory can be accurately tracked. Weather conditions in the area make organising a tow a consideration. More information will be posted online if further contact is made with the two skippers. “Last night we were racing downwind with Arkema in 17 knots of wind, it had died a bit but came back stronger and so we had to be careful. I was inside and Erwan (Le Roux) was at the helm and then one moment he could not see their lights. "Mayeuel (Riffet) called on the VHF to say that they had capsized so we should be careful: we were less than half a mile away. He said that Lalou was fine because he was the one who had been at the helm, and inside Mayeul was well. I asked him if he wanted us to stop, he replied no.